All SOUTHRIDGE PARK homes currently listed for sale in San Antonio as of 04/25/2019 are shown below. You can change the search criteria at any time by pressing the 'Change Search' button below. "GORGEOUS HOME IN THE HEART OF THE SOUTH SIDE OF SAN ANTONIO. MINUTES FROM TEXAS A&M-SAN ANTONIO, PALO ALTO COLLEGE, SOUTH PARK MALL, H-E-B, SHOPPING AND RESTAURANTS. EASY ACCESS TO I-35 & 410. ACROSS THE STREET FROM ARNOLD PARK! HOME BOASTS TONS OF UPGRADES THAT SELLER HAS DONE OVER THE LAST FEW YEARS. 12 MATURE TREES STRATEGICALLY PLACED ON FRONT AND BACK YARD. MOST WINDOWS REPLACED IN THE LAST FEW YEARS, UPGRADED BATHROOMS, WOOD AND TILE FLOORING THROUGHOUT. NEW ROOF 10 MONTHS! UTILITY ROOM NE"
"This freshly painted 3 Bdrm 1 bath home has several eye catching features which include new light fixtures,stylish countertops ,ceramic tile, NEW roof and NEW AC! This home has a fenced back yard perfect for safe play and family BBQ's. 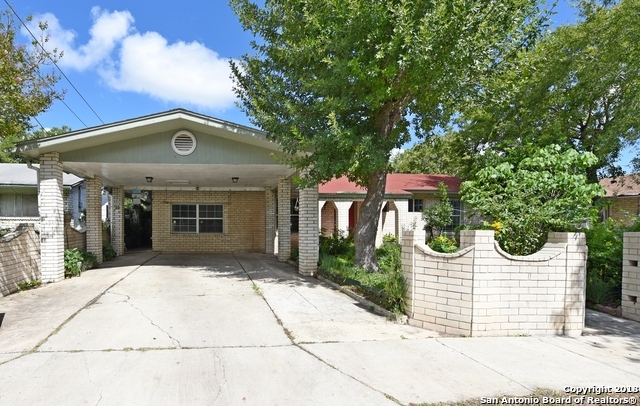 Located on a quiet cul-de-sac, just minutes from Palo Alto College, Texas A&M SA Campus this home is eligible for the city of San Antonio down payment assistance program of up to $15,000 to cover down payment and closing cost for qualifying first time home buyers."